We are deeply honored you’re here. We are spiritual thought leaders, teachers of life mastery and personal development, high-frequency catalysts, international #1 bestselling authors and global inspirational speakers. We are on a soul mission to help empower you with the tools, experience, and understanding you need to create a life with no limits. Ready to create massive breakthroughs in all areas of your life? We always had the desire to meet life from a place of deeper meaning. From a young age, we both knew there was so much more to life than meets the eye. Growing up, life challenges lead us to explore our spiritual connection, and as teenagers, we both had a profound awareness that we were here to share something special. Daniel knew his mission and purpose was to “set people free.” At 18, Sandra had a profound direct spiritual awakening experience that revealed to her that life could be lived from a place of bliss, joy, and love. Having both had inner awakening experiences that changed their lives forever, they were compelled to begin sharing what they learned. Sandra’s extraordinary gifts became evident and she knew she had to share these gifts with the world around her. To make this choice requires overcoming a million challenges and fears and choosing love above all else. In 1998 Daniel walked into her life and has been her spiritual “rock” and co-creator of their soul-driven mission to free people to live a life without limits. …ALLOWING PEOPLE TO TUNE INTO AN ENERGY THAT HELPS THEM RECOGNIZE AND EMBODY THEIR TRULY INFINITE POTENTIAL AS A HIGH-FREQUENCY BEING. We are eternally grateful to have touched the hearts of many thousands of beautiful people on the path towards realizing their greatest potential through live immersion events and retreats, one-on-one mentorship, online intensives and training programs. We are guided to activate the energy in others that empower them to release the low-frequency blockers holding them back from having a high-frequency transformational breakthrough. We’ve worked with people from all over the globe to energetically shift their awareness and enter a state of connection and expansion as they move into the awe of being free to realize their true nature. We knew in our hearts we had to do everything in our power to share that experience with you. This is what drives us to create the programs and events that will expand you towards these realizations. When you have the experience of being free from the unconscious obstacles sabotaging your everyday experience of life, your energy expands into a high frequency where you feel empowered to transform yourself and the world around you. The energy field flowing through us is holding you and moving you towards your ultimate potential for energetic expansion and the awareness that you are pure love. The energy that we are so deeply honored to experience and share with you is like a spotlight on the truth of your most authentic Self – Your True Self. The adventure of discovering who you truly are is the most satisfying and exhilarating journey you will ever take. Move beyond your unconscious programs that keep people small and ignorant of their True Self. Listen to your soul’s choice to grow, evolve and have fun as it rediscovers the voice within that knows the truth of your limitless potential. The energetic expansion is the reason you’re here and our role is to be the catalyst for your expansion. Like us, you already have all the ingredients for transformation. You just need a catalyst to create the desired reaction. That feeling that you have, that there’s more to life than meets the eye, that everything is happening for a reason, and that somewhere out there are the answers to your questions… Well, guess what? From the depths of our hearts, we hope that this is just the beginning of our relationship. We look forward to walking with you on the path of personal transformation and creating the life of your dreams with you. We invite you to transform your energy, to find the peace and love that comes with transforming your unconscious, and, in the process, discover your life’s purpose and the boundless possibilities that await you. transformational leadership and soul enrichment. With her down-to-earth wisdom coupled with her multi-dimensional gifts, she creates profound sustainable shifts. Sandra is committed to working with leaders who are passionate about attaining the next level of success and making a global impact. “Known for solving unsolvable problems”, Jack Canfield said, “She is a profound healer, trainer, speaker and author who does some incredible transformational work. I’ve experienced her work and found it truly life changing — so much so I had her work with my entire staff with magical results. She has an amazing ability to shift energy and remove unconscious blocks on very deep levels. Using her unprecedented laser-like techniques, Sandra takes the brakes off your unconscious, freeing you to accelerate into the thrilling experience of a life without limits. Daniel Biskind uses his expertise in personal transformation to fulfill his mission — empowering you to set yourself free, transform your lives and become the best version of you. Since meeting in 1998, Daniel and Sandra created second and third careers together. They designed and created the Eagles Nest resort in New Zealand. Built on a power place it was intentionally designed to amplify the frequency of unconditional love emanating from it. They were inspired to create Eagle Nest as a venue to do their personal transformation work. In only its second full year it received the highest rating in the Conde Nast Traveller 2008 Gold List of the World’s Top 100 Hotels. The World Luxury Hotel Association awarded it “Global Winner — Luxury Coastal Hotel” in 2010. In 2013 the World Travel Awards named it the World’s Leading Boutique Villa Resort. Daniel had a 25 year multi-award winning career in large scale mixed use property development in the U.S. He has extensive leadership experience in community, civic, charitable, professional, industry and spiritual organizations. Daniel has mentored and consulted with leaders for over 30 years. One of his mentors was Lawrence A. Appley, the legendary President and Chairman of the American Management Association over four decades and recipient of the Presidential Medal of Merit. Appley, who discovered Peter Drucker, included a chapter on Daniel in a book on CEO’s he had known in his illustrious career. Daniel has had a lifelong focus on personal transformation. He has explored numerous expressions of world spirituality in great depth and has had mystical experiences throughout his life. He cites his involvement in the peace, civil rights and women’s liberation movements as early expressions of his mission to empower people to set themselves free. He describes his relationship with Sandra as the most important influence in his ongoing journey. Sandra and Daniel’s clients and students are committed to breaking through to the next level of success in their relationships, health and financial well being. They know that life is a never-ending process of growth, creativity, and fun. In fact, that’s exactly why we are all here: to evolve – and to have fun. However, everyone has encoded information in their DNA and genes that act as blocks to success, to love and to having a strong healthy body. You know you must put your own oxygen mask on first. And, you know the most important investment you can ever make is enhancing your own wholeness. While direct investment in finance/career, interpersonal relationships, and health/fitness can and should be rewarding, external circumstances can always change unexpectedly. Strengthening your own inner ability to thrive regardless of external circumstances enables you to not just cope with, but conquer challenges– no matter what they may be. Wholeness involves getting to the real cause of your inner blocks or challenges. The real cause of struggle is hardly ever what you think it is. The good news is you can change the encoded information responsible for feelings of fear, negativity and pain efficiently and effectively using the tools and techniques in the Ultimate Mind Shift. The Ultimate Mind Shift delivers transformation in nanoseconds. Although it is literally that fast, most people need a little time to process the shift and recognize it. Sandra and Daniel work in 4 areas of life: Love/relationships; finance/work; health/fitness; and awareness/meaning/purpose. Their mission is to empower you to set yourself free from the unconscious programs and beliefs that cause negativity, pain and stress. The Ultimate Mind Shift is an individualized approach to personal transformation and success principles that can take you as far, as high, as deep and as fast as you are prepared to progress in the open ended evolution of your soul. The philosophy and practices of The Ultimate Mind Shift are expressions of the perennial wisdom of the world’s major spiritual and religious traditions. It blends Western psychological insights, Eastern spirituality, and universal mystical traditions with groundbreaking transformational scientific technology. “We’ve sat and studied with saints and sages, gurus, rishis, and enlightened masters on 5 continents for over 8 decades between us. Our transformational resumes would each take pages. We work with people from every religious and spiritual background and help them strengthen their connection with the God of their own understanding. The trust they place in us is an honor for which we are deeply grateful. What is most striking is what all the great traditions share in common. And what is most important is creating user-friendly ways to make these timeless principles relevant and usable to contemporary individuals. Who are Sandra and Daniel Biskind? Both Sandra and Daniel discovered their mission to empower people to improve their lives at young ages. Throughout the Biskind’s multi-award-winning careers, the major theme in their lives has been sharing their transformational journeys and experiences. Both have been in a wide variety of high profile leadership roles and feel a special calling for fellow leaders. They work both as a couple and individually to help clients free themselves from limiting beliefs and find inner strength, joy, and wholeness. Their combination of spiritual and personal gifts, training and experience combined with their international business successes and credentials gives them a unique perspective and capacity to deliver transformation and sustainable change in the people who work with them. The Biskinds founded the Eagles Nest resort in 2002, which received the highest rating in the Conde Nast Traveller 2008 Gold List of the World’s Top 100 Hotels. The World Luxury Hotel Association awarded it “Global Winner — Luxury Coastal Hotel” in 2010. In 2013 the World Travel Awards named it the World’s Leading Boutique Villa Resort. The Biskinds sold Eagles Nest in late 2012 to devote themselves to their mission full time. Did you know everyone lives by codes? And that those codes have the power to either uplift you or sabotage you? 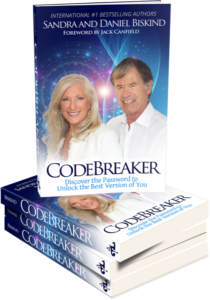 CODEBREAKER presents a simple system to identify and delete the codes that cause all of the negative feelings in your life. It is a proven system that has helped 1000’s around the world. The book cites advanced scientific breakthroughs to create a comfortable conceptual context for the innovative yet user-friendly system. It is written in a fun, approachable style that entertains and educates as it informs and inspires. CODEBREAKER book is available now on Amazon. Get your copy today! The Ultimate Mind Shift is a systematic approach to personal transformation that identifies the unconscious causes of self-limiting behaviors and self-inflicted negativity. It creates energetic shifts to quickly dissolve these patterns so the client or student is free to realize their extraordinary human potential. Sandra and Daniel work with a limited number of private clients – highly successful individuals committed to becoming the best versions of themselves. They teach and train people in the use of their system via written and electronic media and live events. They present their work to organizations in a variety of formats. Platinum Circles are small peer groups that meet regularly to support one another’s personal development journey into enlightenment and wholeness. Using the PLATINUM password, PEACE LOVE AWARENESS TRUST INTEGRITY UNITY and MINDFULNESS and a variety of resources provided by Sandra and Daniel, your circle becomes a spiritual filling station where you can regroup and develop your intuition, give and receive healing and master the art of meditation. Everyone knows it is easier to evolve and grow in groups than alone. As Jack Canfield said when asked how to keep the high of a retreat in normal life circumstances, “Meditate and create a mastermind group to support each other.” Platinum Circles are the perfect combination of meditation and mastermind for your body, mind and soul.